I'm going to be doing a project with a 2500 in the near future and would be interested in any advice or helpful links you might be able to provide. I don't know the full compliment of modules that it has or anything. Just know it was recently fully restored. I'm going to be locked in a room with it for a few hours and am planning on recording a bunch of material that I'll later work with in the computer. All I can say is, Have fun with that! A few hours? Maybe a few weeks? Sorry, no help from me, I can only say, it is the dream machine. you may find other videos from that blog. The 2500 is a "happy accident" synth so you are best not going into it with a specific destination/sound in mind. The matrix makes it very easy to do lots of crazy modulations that you might not think about doing normally. Most of the action happens with the lower matrix. I found that it was important to get the lower matrix up closer to eye level since you really need to look at it straight on to see the matrix routing properly. Enjoy your time with the instrument! I had access to one of these for a couple years back in the late '70s. It's got a really sweet sound. I fell in love with the uniquely colorful high-pass filter at high resonance with inverse envelopes, and have been trying to duplicate that sound ever since! I used to work at a studio that had a 2500. Owned a 2600 for years. Both great synths. I wil say this- IF you are limited on time and you feel like your moving in the wrong direction DO NOT PULL AND ZERO out. You'll just waste time. I agree with the happy accident post above. Go into it open minded. I'm sure there's a pdf available for download of the ARP 2500 Owner's Manual. Lot's of info on individual modules. To anyone that's had some experience with 2500, or just understands this better than I - in the vintage ads for small portable systems called 'Concert Wings' they mention the abilty to play 5-note chords, yet even the larger one ("Concert Wing II") had only two oscillators. These systems don't appear to include keyboards and don't have even a single VCA (except the one in the Voice module, but that one is only accessible within that module); clearly they are for strictly sequencer music. But how could they produce a 5-note chord? Even with a duophony kb, how? I ask mainly because I'm building some rough 2500 emulation free vsts and would like to do one based on Concert Wing II. - in the vintage ads for small portable systems called 'Concert Wings' they mention the abilty to play 5-note chords, yet even the larger one ("Concert Wing II") had only two oscillators. These systems don't appear to include keyboards and don't have even a single VCA (except the one in the Voice module, but that one is only accessible within that module); clearly they are for strictly sequencer music. But how could they produce a 5-note chord? Even with a duophony kb, how? Had to look twice myself. Those applications are listed as 2600-2500P. So with the three oscillators of the 2600 using the 2500P cabinet as an expander to the 2600. Would love to have one of those 2500 wing cabinets, portable or the wood ones to get the 2500 voice. Aha - great detective work - i didn't see that; makes perfect sense. Not much point in doing it as a vst then. I'll get right on it - how big is your monitor? A couple of things to do as a standard practice using a 2500. First thing is to try and keep the audio outs on the bottoms rows of the matrix. This is to avoid accidentally sliding a full level audio or DC signal through those rows going to another row - destroyed speaker can result. Also try and space large signals on rows with non-used rows between them to avoid cross-talk. Don't forget that multi-cabinets can have the row dis-connected by plugging into the jacks in the center. The top matrix is primarily for the CV and Gate/trigger from the keyboards and many modules don't even have connections there. The empty rows typically go unused. Remember also that the Envelope generators on the 2500 are re-triggerable ones. This means that they can use both Gates and triggers at the same time and that they have separate inputs. A gate is needed and will go through the A,D and sit at the S of a standard ADSR envelope, but a trigger given to the trigger input will cause the EG to cycle through the A and D sections again. This can be used great for trills and paraphonic uses. @ersatzplanet - that really is a fantastic photo. What were the big boards for? And did you use the church organ as well? Very curious to hear more about this set-up and it's use. That was the concert hall at Wester Washington State College (now Western University). The backdrop was their chorus/concerto shell and typically used to amplify and direct acoustic performances much like an outdoor acoustic shell. Just for look here. The main cool thing they had tech wise was the PA system That you can see on column in the background. It was a Heil Air Motion Speaker system (the stereo "rage" at the time) which used the newly design Air Motion Transformer system, THE most transparent and full range high end you have ever heard from a PA. It probably was an awful PA for microphones because it basically had over 180 degrees of dispersion, but MAN did it make a synthesizer sing. You could almost cut people in half with that thing if you wanted to cause the high end could go so far up. I don't know whatever happened to that company (this picture was taken around 1974 or so) but for EM that PA was the best . There was a tape deck for loops, an echoplex and I don't remember what the other keyboard was. That setup was used for more than one group but most of the stuff in front was for me. I don't know whatever happened to that company (this picture was taken around 1974 or so) but for EM that PA was the best . Heil is still in business, I know them mostly from their great microphones. He founded the company Heil Sound in 1966, which went on to create unique touring sound systems for bands such as The Grateful Dead and The Who. The 2500 sounds much different to me from the 2600. Can someone explain why this is? Is it only the prepatching + smaller size of the 2600 or are there other components involved? The 2500 seems to sound brighter, even more hi-fi in a way. The 2500 sounds much different to me from the 2600. Can someone explain why this is? Is it only the prepatching +smaller size of the 2600 or are there other components involved? The 2500 seems to sound brighter, even more hi-fi in a way. The 2500 sounds different because it is different. The circuits are different, the components are different and the available "easy" patches are different. This is due to both the modules themselves and the matrix-switch patching. The Oscillators of the 2500 are a dual core triangle/saw type while the 2600 is straight saw. The sine waveshaper is 4 bipolar transistors instead of the dual FET in the 2600. The pulse is discretely shaped in a 2500 and the 2600 uses a now typical opamp. All 2500 VCOs have 5 waveforms, with the 1004s allowing all at the same time from each osc. Multiple noise sources in the 2500 instead of only one on the 2600. Single vs. multiple triggering of the EGs, which have different gate requirements top vs. bottom, and the ability of the 1033 to delay its envelopes. The 1047 multimode filter has no parallel in the 2600, and is itself a classic which inspired another classic in Dave Rossum's UAF. Something like the percussion circuit of these can be patched in a 2600 but it will not sound the same. The 1036 sample and hold of the 2500 is a dual unit with dual clocks where the 2600 only has one of each which is also severely limited in an unmodified 2600. There is no 2600 equivalent to the 1050 mix sequencer of the 2500. There's no sequencer circuit at all in the 2600, where the 2500 has both the 1027 and the 1050. Not wanting to get into golden ear theory, it still could matter that the power distribution of the 2500 was certainly worse than the 2600. At least as important as the circuits in any notable sound difference is the care and method used in making 2500s vs. 2600s. When you read the technical docs for each you see that the 2500 was held to higher standards in meeting most specs. For example the PWM of a 2500 has a SELected resistor for each end of the range to accurately set 10% and 90%, where the 2600 does not.These SEL components are in addition to the trimpots present in most 2500 modules. The 2600 also has trimpots, but in far fewer places and with less specific control or expected limits outlined in the docs. Alan Pearlman was fresh from the space race when Tonus and the 2500 was launched and you can see its effect in the 2500 technical papers and circuits. Dennis Colin had just come from designing military Radar. The details of the 2500 modular concept itself and the matrix switch may owe its existence to what was being done during the Apollo space and US defense programs. This space race cold war mentality is also seen in the components chosen for the 2500. Many are high end military grade. A 2500 has Type 1339 opamps for audio, and 301s otherwise. Early 2600s did also, but most 2600s heard now will be either all 301 or upgraded with better audio opamps to make up for the various 1339 and 301 limitations. VCO timing capacitors in the 2500 are polypropylene and no longer made polycarbonate high voltage types. In the 2600 they are silver mica. Without getting into audiophile mumbo-jumbo territory it is true that capacitors behave differently, and these differences can make themselves heard. The rotary pots of the 2500 are clearly different from the sliders of the 2600. Resistance being resistance, the electrical effect is not the point. Rotary vs. slider does matter to your question and will be covered later. In this same vein the many lamps of the 2500 are not present in a stock 2600. Submodules of both 2500 and 2600 were individually tested. But the 2500 then added quite a bit of individual full module component level tests and performance-based part tailoring which was not done for the more widely aimed and lower priced 2600. 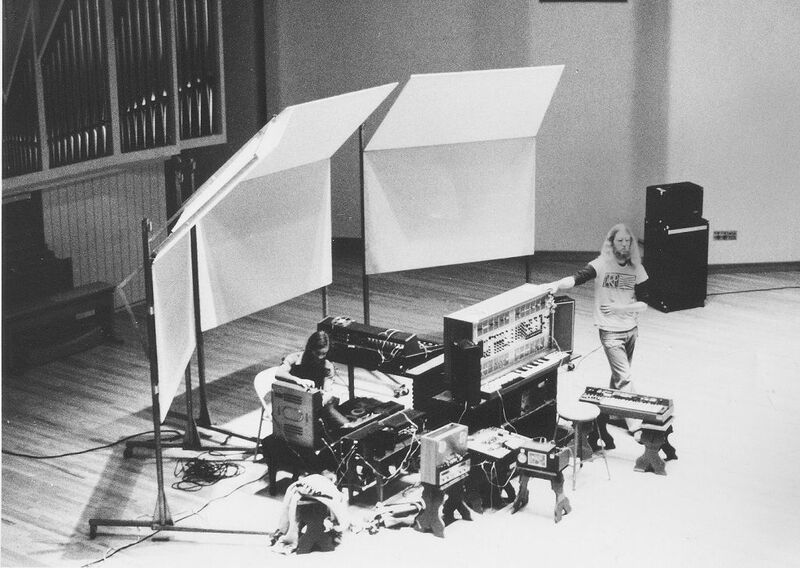 The 2500 was designed for sound creation as "The Concert Grand" of synths. The 2600 was designed for sound education. The combination of circuit and component differences might be the reason you say the 2500 sounds brighter, or hi-fi. Certainly this is promoted by Phil Cirocco on his website. There's that, but there's more going on than an opamp. This applies not only to the ARPs but to all synths. Or what David Friend of ARP liked to call Human Engineering. Although the differences in circuits and components above play their part in what you hear, the sounds which led to your question have probably more to do with the differences in module and front panel layout, their connections to each other and the overall instrument interface. Let's start with what was called easy patches above. Like nearly all synthesizers, the 2500 and 2600 are full of interconnections before you even start. Those include the 5 input slider mixer of the VCF on the 2600, the 5 waveform knob mixer on the 1004P Osc, or the 5 switches of the 1004T Osc. With just these alone, we see an instant difference in how someone is going to approach the building of sounds in one versus the other. In a 2500, you're going to *easily* select waveforms from Oscs, and invert or mix them as a core operation. In a 2600, you'll do something similar using the VCF sliders. But you only have the prepatched 5 sources to work with natively. or naively. And that means, compared to the 2500, you get a square wave, a pulse, and a saw from your VCOs. Add the noise and ringmod, and this is what you're *most* likely to work with. Yes, you *can* patch other things. Yes, you *can* use the voltage processors of the 2600 to do some additional mixing. But will you? Truth be told, most of us are lazy. We act like electrical current and seek the path of least resistance. With a 2600 you'll focus more on what goes *in* to the VCF and on the 2500 it's easier to focus on what comes *out* of the VCOs. One is just flipping switches and turning knobs with certain results and instant feedback. The other takes thought, time, effort and does not guarantee anything usable at all. 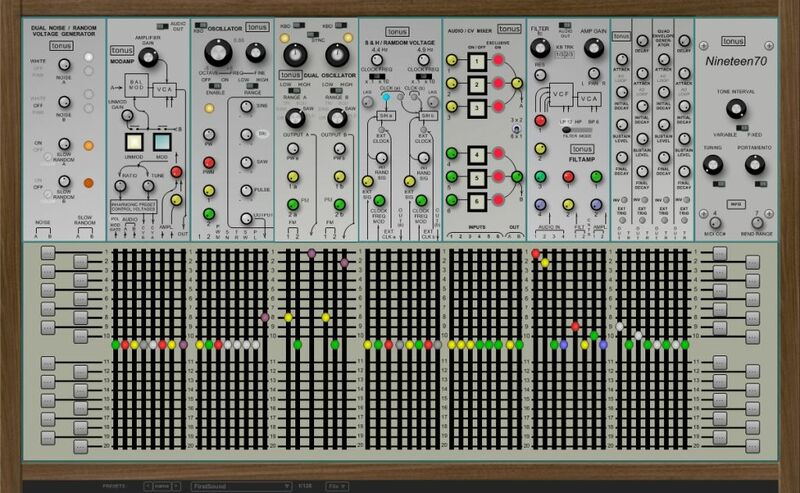 If you look at the rest of each ARP synth, or any synthesizer really, you see these design choices again *many* times over. And each one is going to be a difference to overcome when going after the same sound from two different synths. It's a really big deal which gets glossed over in all the talk about the sound being behind the panel. Don Buchla understood this. So did Alan Pearlman and David Friend. Another detail of the interface which plays large in the sound is the sliders vs. rotary pots listed earlier. Imagine tweaking a sound with a knob vs. a slider. With the knob you'll probably just grab it and twist a bit. The shaft is a fulcrum of the lever the knob becomes as you move it. With a slider, most of us will plant a finger on the panel near the knob and that becomes the fulcrum of the movement applied. We nudge it. It's hard to make a small move to a slider by just grabbing it in the air. Moreso if the slider is sticky in its travel. How about a big change? Moving a slider through its entire travel is very different than rotating a pot knob end to end, from a human engineering perspective. Having one or the other is going to affect and effect how you play the instrument, regardless of the sound you're after. And those differences might be what you're hearing. The lamps of a 2500 do not show value, only selection. Off or on. Still, this is something an unmodified 2600 lacks, and even the limited feedback of the 2500 is going to interact with the operator in a way the 2600 can't. A related discussion is unmarked or indecipherable panels compared to analytically aimed labeling. Both have their strength, weakness and place. Each is most certainly different and the results will probably reflect the difference. Same with the lamps of the ARPs. 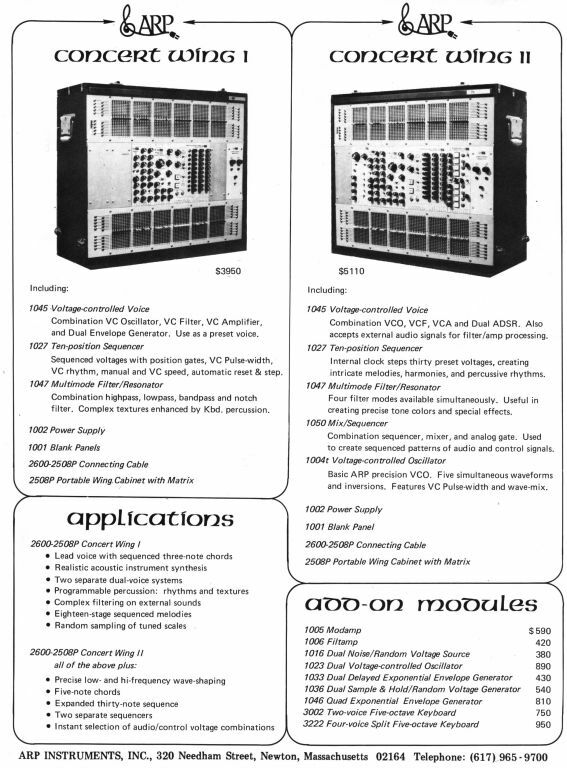 Each module of a 2500, or each portion of a 2600, has certain inputs and outputs. Looking at one example, the VCA in a 2600, besides being the only true VCA at hand, may be used completely separately by patching. Try that with a 2500. Modamp 1005 and Filtamp 1006 do not have VCA-only inputs. Unless you have the rare 1035 triple modulator, with its three balanced modulators which can be used as low grade VCA's like the 2600 Ringmod, you're out of luck. The only true VCAs in the 2500 are inherently tied to either a lowpass ladder filter or a 4014 style ringmod. Certainly this is going to affect the sound. It's obvious that these inter-module connections and controls combine with the available input and outputs in ways which are different for each synth. These differences will be sure to affect the typical approach used in sound crafting for one vs. the other. And you're going to hear it in the result. Because one has to swim upstream, so to speak, to get a result against the pre-determined by design choices outcome. The 1045 voice module may have been used in a subtle way in patches you've heard. Which means compared to a 2600, there is a full VCO,VCF,VCA,dualEG voice which may be only a small part of the whole sound, but surely not unimportant. And factoring what was said above, it's easy to do this. To give a whole module to a small bit of the result. Much harder to do that with a 2600, where using something one place very often makes it audibly absent from another. Maybe this is why so many TTSH's are seen in pairs, or more? 2600's too, as with Zawinul. Finally, the elephant in the room. The matrix switches. Some see these as the blessing or the curse of the 2500. Whichever it is, they do play a huge part in the shape of the result when path of least resistance is taken account. They are more like bananas in they way you patch than the jacks you'd use in the 2600. A banana module looks and works differently than one based on TS patchcords. Although the 2500 has multiple V/oct inputs for its Osc's where a Serge might have only one, so it's kind of a superset. The important thing is that as with bananas you can easily, there's that word again, add more sources or destinations to a given input or output. Unlike bananas, there's not the same kind of visual, physical tower obstacle to setting a whole bunch of matrix switches to the same bussed in and or output. Sure, nanners can be stacked as high as you want. How often are they really stacked more than 3-4 high? Adding more than 3-4 matrix positions to a given 2500 input is easy, and although it may come with its own problems, it is a low-cost effort. You know immediately whether it was better or worse and happy accidents are a big upside. Ugly accidents with the matrix can happen too as James mentioned in this thread referring to the output buss being best at the bottom. Inherent to this matrix switching system is the other blessing or curse of the 1K output resistor. Again, this "instantaneous sum" result is not the same as a true mixer. So you can gather a bunch of mults to use with a 2600 and still not be where a 2500 goes naturally. Matrix switch patching of a 2500 is a strange combination of left brain and right brain work. Down, across, up with bumps and misalignments along the way due to the physical mechanical details keep the logical part of a brain well in play. Meanwhile those happy accidents, the ease of adding just one more or taking one away with immediate feedback fosters creativity in patching that isn't the same with other styles of patching. Bananas and stackcables are closest, but still very different. No unstacking and restacking to add and remove, if we're comparing a 2500 to bananas or a 2600 patched with stackcables. To plug in or remove more than 2 nana's at the same time is harder than moving multiple Matrix sliders at once, mixer desk like. However, bananas do have the advantage of not being limited in overall number. The earliest 2500's had 20 lower and 10 upper busses. In the early models these could be broken into 3 parts horizontally. Later models only split in the middle. You have a finite and fairly small number of patchcord equivalents. In relation to your question about the difference in sound, this limitation, like others in all synths, comes strongly into the sound. Try it. Force yourself to use only 20 patchcords and see what results. When you reach your limit, you have to trade something away to gain the patchcord you want. Worse, if you had the full 2500 dual keyboard complement, all 10 of the early upper matrix were used for CV, gates and Triggers. This is why many 2500 modules have very limited IO up top, and at least part of why later 2500's have 10 more busses up top. One more difference is that the 2500 is huge cabinet-wise, and small module-wise. It can be shocking to see just how small and closely packed some modules of a 2500 really are. Much more like Serge or Euro than 5U in many places. In contrast, the 2600 is spacious. Everything affects the sound. Panels are just as important as the circuits behind them. The choice of pot, jack, switch and indicator is as important as the interface itself. Can't overstate the value of a lot of the subjective things you've so eloquently pointed out here!